The are certain reqirements for Renaissance Festival spelling and signage. It includes a lot of "y". Such as Fry. Or Tyme. Regardless. Saturday we went to the Colorado Renaissance Festival. It was my first visit there. The only other one I've ever been to is the Bristol Renaissance Faire in Wisconsin. They are similar in the respect that the park has permanent fixtures - stages, jousting areas, food outlets, shops, etc. You couldn't really use it for anything else other times of the year. It is an excuse to embrace your inner wench, pirate, knight, or lord/lady of the realm. Those in some kind of costume outnumber those in flipflops and shorts. If you didn't wear even a renaissance accessory, you will be compelled to buy something. 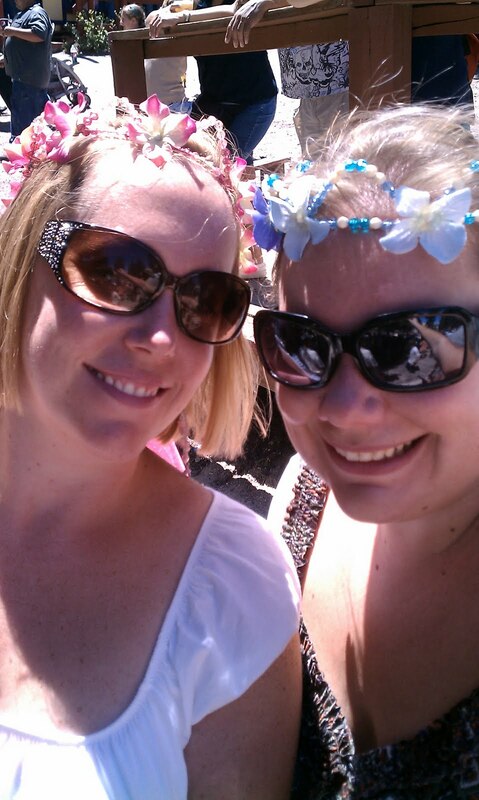 We opted for flower garlands (that will serve a double purpose at the upcoming yard game olympics). The entertainment is a lot of fun ~ audience participation, heckling and insults are mandatory. Some of the fun shows we saw were the Washing Well Wenches, Charming & Dashing, Flourish & Fool and the German Brothers. We are still quoting lines from the German Brothers German Comedy Rap Show. Did you know that the Ren Faire caused me to meet one of my neighbors. Sunday morning he is out in the driveway in costume (including a hat with a feather). It started a good 10 minute conversation!